I recently volunteered at SAM’s Teen Night Out, and one of my favorite moments was watching the youth interact with the record players in Theaster Gates: The Listening Room. This exhibition features a collection of thousands of records from a defunct record store in Chicago and transforms the gallery into a lounge in which visitors are invited to pick up a record and play. 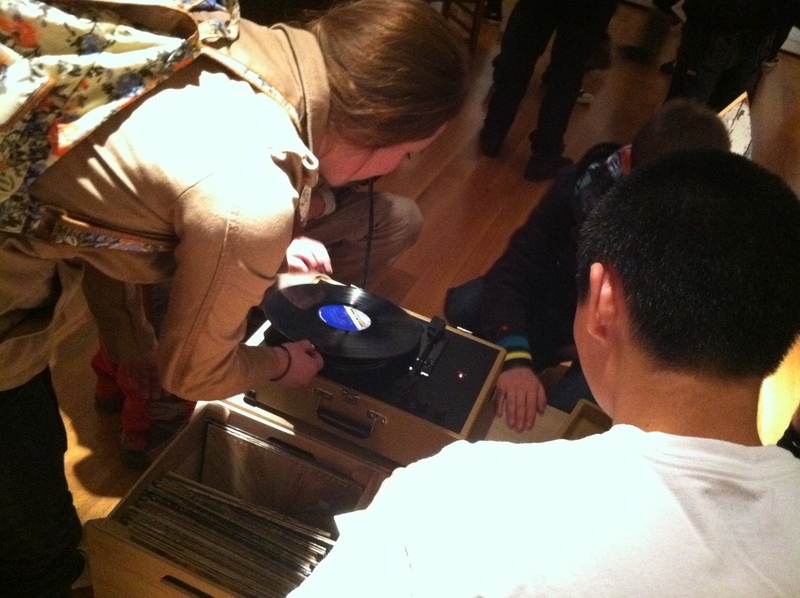 Many of the teens I observed that night clearly had never seen or handled a record player before, but there was obvious delight in figuring out how to use the machines and of being able to actually touch things at a museum. A few days after watching teens experience vinyl at SAM, I went to the opening of Record Store, a temporary extension of the Theaster Gates show housed in a storefront in Pioneer Square. A collaboration between SAM and Olson Kundig Architects, the Record Store is open for the general public to browse the robust collection of records and play albums for the entire store or listen in a small group. 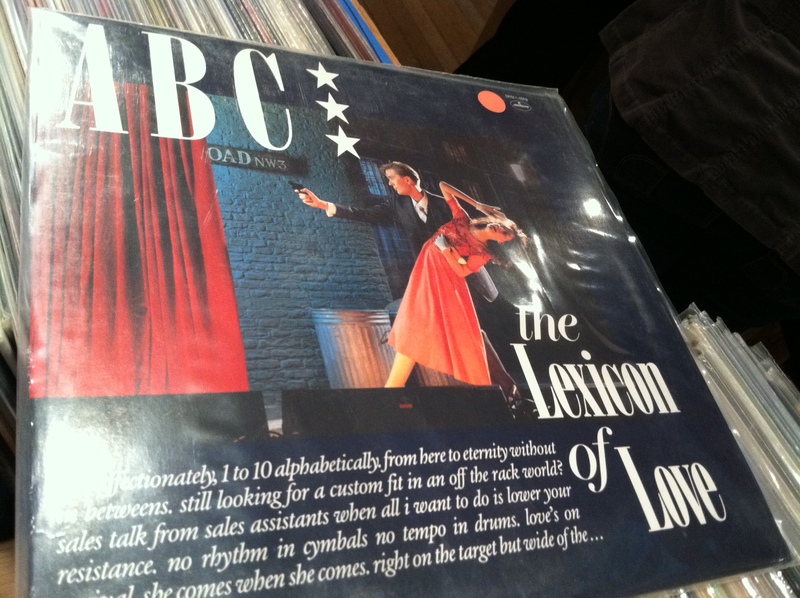 Musical memories came rushing back as I walked through the Record Store. I remembered being a little girl so in love with Andy Gibb that I slept with his album, Shadow Dancing. I recalled how my babysitter would blast Blondie’s Heart of Glass. I picked up Michael Jackson’s Thriller and thought about how my friends and I would rush home after school to listen to it over and over again. I was reminded how cool (or ridiculous) cover art could be. Clearly I was born before 1980, but the Record Store is a space that anyone can enjoy regardless of whether their age or relationship to records. While nothing is for sale in the store, the exchange of ideas and concerns is encouraged. The goal is for the Record Store to function as a cultural commons where ideas, issues and moments in time are discussed, debated or responded to. The Record Store will feature a series of “listening parties” with guest DJs, artists, community folks, dancers, musicians, urban planners, activists, etc. Each “selector” will borrow from the same collection of LP’s or brings a few of their own records that act as the sound track that illustrates their ideas. Irruptions might take various forms including: debates, writing or dance classes, silent reading, tastings, workshops, to-do-lists or a sermon. See the schedule below for more details! Join Bernie Hall (aka DJ Brother Nature) for an evening of Grooves, Moves, Blues and Community Views. This evening of good music, good conversation and good people is bound to be memorable. Having lent the largest collection of LPs and 45s to the Record Store, Bernie Hall collects records and shares them with those around him. Hall retired from a career as a social worker in Seattle Public Schools. He is an extraordinary storyteller! One of the co-conspirators behind the noted SAM Remix, Greg Sandoval is the Manager of Adult Public Programs at the Seattle Art Museum. His keen knowledge of popular culture, music and visual art will make this evening of listening, doing and chatting an uncanny night to remember. Bring your intellect and share your personal experiences as we examine music through the lens of gay rights, the onset and impact of the AIDS epidemic, and queerness as we celebrate it today. Sandoval will be joined by a host of interesting personalities. Bring some vinyl, your voice and participate. Don’t miss this eclectic evening of music, art, social justice and the environment hosted by Eddie Hill and Karen Toering—two of Seattle’s most compelling thinkers and doers. Hill was a deejay during the height of the San Francisco Rave era (1989 – 1994) and learned the fundamentals in Chicago and Detroit in the late 70’s and early 80’s. Transitions in music are his focus, blending political speeches with Cameo, Bauhaus, The Orb and Johnny Cash. Eddie Hill, urban planner, mixed-media artist, curator, and educator. His includes over two decades in media, public affairs, visual and multimedia arts working as a reporter, radio producer, graphic artist, arts manager/curator, and arts instructor for Coyote Central, Tacoma Art Museum, Pratt Fine Arts Center, Nu Tribes Arts Collective and the Seattle Public Schools. Hill merges arts, environment and social justice to advocate for policies and practices that promote the integration of arts, environment and design into communities and schools. House music and techno is as seminal as punk and UK rock. Karen Toering is cultural worker who finds joy in the spaces where justice and art intersect. She is a grant-writing and development consultant for nonprofit arts, cultural and social justice organizations. She is Director of GroundUP Organics, an urban farming and food justice program for youth and young adults. Her passion also includes film, where she Program Director of Seattle’s Langston Hughes African American Film Festival and founder of the Gary International Black Film Festival. Calling all jazz heads to the Record Store for an evening of intense listening, great conversation about jazz and the vinyl record with Seattle’s own jazz aficionado John Gilbreath. The host of KEXP’s Jazz Theater, Sunday nights, from 10 pm to midnight, Gilbreath has been a rabid jazz fan since childhood. He has been immersed in the local and national jazz and performing arts scene for the last 12 years as executive director of Earshot Jazz, Seattle’s nonprofit jazz-support organization. He oversees Earshot’s monthly publication and educational programs, and has produced more than 1,000 far-reaching concerts, including the Seattle’s annual Earshot Jazz Festival each fall. He actively works with various Northwest arts organizations and national jazz consortia hosts the weekly Caravan show on KBCS, he curates Seattle Art Museum’s Art of Jazz longstanding series and, in his rare spare moments, is a student of stone sculpture. Hollow Earth Radio broadcasting Live from the Record Store. Come out and be a part of the audience! C. Davida Ingram (performance artist and writer) and a few creative friends use the Record Store collection to explore sampling and loops as a form of social reminiscence and storytelling. Ingram is a cultural worker with a dynamic background. She is bringing a brilliant group of people to the Record Store to ignite participation in unforgettable creative activities that will bring warmth to the first week of the New Year! Joshua Kohl has created original works for dance, silent film, concert ensembles, “classico-punk-big band” shows and street performances and has collaborated extensively on the creation of invented instruments used in DAE performances. Kohl has performed extensively throughout the U.S., as well as in the Netherlands, Italy, Slovenia, Slovakia, Czech Republic, Poland, Italy, and Germany, with the support of Arts International Fund for U.S. Artists and the Mid-Atlantic States Foundation’s U.S. Artists International. In addition to his work with Degenerate Art Ensemble, Kohl has created scores for the San Francisco-based dance theater company inkBoat; for a commissioned performance of c(h)ord (2008) at the Yerba Buena Center for the Arts, San Francisco; Tale of Two Cities (2007) and Night Flight (2007–2009) for Seattle’s Book-It Repertory Theatre; as well as Twelfth Night (2007) and The Beard of Avon (2007) for Portland Center Stage. In spring 2011 Kohl will perform with Haruko Nishimura at the Center for Performance Research in New York City, and he will be in a residency with DAE at Robert Wilson’s Watermill Center: A Laboratory for Performance, Long Island, New York. Randy Engstrom is a dynamic arts leader with a vision for the new frontier. Originally from Chicago, he first arrived in the west in 1995 to attend Evergreen State College and moved on to Seattle post-graduation. During his time in the Pacific Northwest region he has helped found numerous creative ventures and organizations including serving as the Founding Director of the Youngstown Cultural Arts Center and Chair of the Seattle Arts Commission. Randy continues to develop innovative programs that help support and nurture vibrant communities through his consulting practice, Reflex Strategies. Join Jason Plourde, the Programming Director for Seattle’s own Three Dollar Bill Cinema, for an evening of that you will never forget. Three Dollar Bill Cinema provides access to films by, for, and about lesbian, gay, bisexual, and transgender (LGBT) people and their families, and a forum for LGBT filmmakers to share and discuss their work with audiences. We curate themed screenings throughout the year and produce programs in partnership with other arts, cultural, and service delivery organizations in the Greater Seattle area. Karen Toering is back to man the store for the day! She is cultural worker who finds joy in the spaces where justice and art intersect. She is a grant-writing and development consultant for non-profit arts, cultural and social justice organizations. She is Director of GroundUP Organics, an urban farming and food justice program for youth and young adults. Her passion also includes film, where she Program Director of Seattle’s Langston Hughes African American Film Festival and founder of the Gary International Black Film Festival. Eric Fredericksen is the director of Western Bridge, Seattle and Chair of the Public Arts Committee for the Seattle Arts Commission. He has curated exhibitions at the Or Gallery, the Bodgers’ and Kludgers’ Co-operative Art Parlour, and the Contemporary Art Gallery, Vancouver. His exhibition Poste Restante has traveled to Artspeak, Vancouver; Limoncello, London; and the Henry Art Gallery, Seattle. His lecture and karaoke evening, “Karaoke and Authenticity,” has been presented at the TBA Festival, Portland; On the Boards, Seattle; and Instant Coffee Light Bar in Vancouver and Victoria, BC. Join Hollis Wong-Wear and the incredible voices of Youth Speaks as they get you writing, performing and chanting with them. When you mix young powerful voices, thousands of vinyl LPs and a few seasoned poets/community folks, the end result is a must see. So…come out. Don’t miss closing night of the Record Store. Mark your calendar now!